SALT LAKE CITY — It’s easy to see how the show came to be a season-long crowd-pleaser the 10 years it played New York City's Paramount Theatre. At Pioneer Theatre Company, “A Christmas Carol: the Musical” is spectacular. The musical adaptation of the Dickens’ enduring story is staged with panache and brio by the company’s artistic director Karen Azenberg and proves to be tremendously enjoyable. The hallmarks of her production are stellar performances, kick-up-your-heels dancing, and expert stagecraft and design. To capture the original intent of what is a personal journey for Scrooge on a single Christmas Eve, it’s best if the staging is intimate. Seeing Patrick Stewart’s one-man performance with no set beyond a lectern was a revelation. Even a threadbare production at Knott’s Berry Farm’s tent-enclosed Birdcage Theatre in melodrama style remains memorable. But if you’re going make it a pull-out-all-the-stops Broadway musical, it’s best to hire Alan Menken and Lynn Ahrens, as Madison Square Garden producers did before the 1994 premiere of “A Christmas Carol: the Musical." The composers have received Tonys, Oscars and Grammys, and what is a ho-hum score heard on the original cast recording is bright and cheery when performed and nicely carries the action forward. When he sings “Nothing to Do With Me,” we begin to see what a fine actor Jamie Jackson is. His Scrooge is horrifyingly cruel, but he also bares pain and regret. The redemption does not come instantly as Jackson peels away the layers through his ghostly visitations to become a compassionate benefactor. Scrooge’s first uninvited guest is the evening’s most striking. With his song “Link by Link,” Justin Ivie strikes a perfect balance between haunting and humorous as Ghost of Jacob Marley. There’s a quick moment of genuine terror felt in the audience when Marley’s fellow undead companions enter through the theater’s side doors and stumble in to some of the aisles in a scene reminiscent of Michael Jackson’s “Thriller” were it more completely frightful. 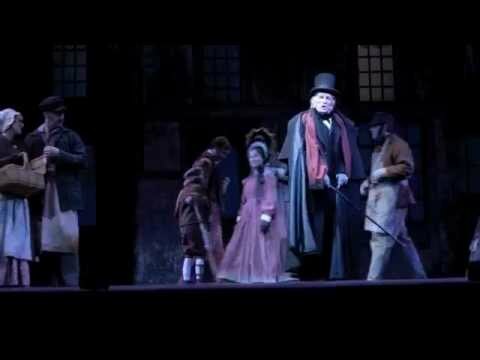 There is powerfully commanding singing from the entire cast, but standing out are the sadly underused Kevin Earley as Bob Cratchit and Austin John Smith as Fred. (Had these actors been in the original cast, there’d be better solos written for them.) The singing from young Anson Bagley as Tiny Tim is also delightfully sweet. Mention also must be made to the 15-piece live band, which sounds as rich and lovely as the accompaniment to most Broadway musicals, led by musical director Tom Griffin. The many entertaining vignettes flow by at rapid pace, but “Mr. Fezziwig’s Annual Christmas Ball” is full of ra-ta-ta-ta-tat fun. The hard-working ensemble’s dancing is showy with the vibrant choreography in this show-stopping scene, and Robert Anthony Jones (Fezziwig) and Keala Settle (the Mrs.) are splendid comic actors. Like Fezziwig’s soiree, “A Christmas Carol: the Musical” could easily become an annual tradition at Pioneer Theatre. But this production is a must-see. The company’s creative team is much too inventive than to rely upon this show to be repeated as soon as next year.